Update 2018: A custom toll free number is a great way to market your small business. Also known as a vanity 1800 number, a custom 800 toll free number usually spells a word associated with your company. This makes your business phone number easier to remember when used in advertising such as radio, print or web. However, finding the perfect custom 800 number for your business can be a challenge. Many number combinations are currently in use, so you may have to think outside the box when thinking of vanity number words. 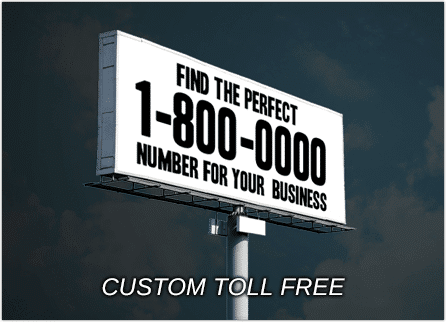 Why get a custom toll free number for your business? A custom toll free number helps build your brand name (e.g., 1-800-GO-FEDEX). Custom numbers that spell a word are easier to remember which makes them perfect for radio, web, and print advertising. And a custom phone number or a vanity telephone number has the same portability rules as all 800 toll free numbers – meaning you own your number and can port it to any carrier you wish. 1. What is a custom toll free number? A custom toll free number is an 800 number that spells a word that’s simple to remember. Often a vanity 800 number spells a company’s name or a phrase associated with the company’s industry (e.g., 1-800-GETALOAN). 2. How can I get a custom toll free number? Getting a custom 800 toll free phone number is not just for large companies. UniTel Voice provides customer toll free service at a low rate and with features that make running a small business much easier. If you decide to give UniTel Voice a try you can sign up online and create your account instantly. The first step of the sign up process is choosing your number. In this step you can choose from a list of recommended toll free numbers or search the national toll free number database to find the perfect custom number. You can find vanity numbers available in almost every toll free prefix (800, 888, 877, 866, 855, 844, and the newest available 833 numbers). 3. Why is it so hard to find custom 800 numbers? It’s hard to find “true 800” numbers that spell the custom word or phrase you are looking for because the pool of available numbers in that prefix is so sparse. True “1-800 numbers” were first released in the early 1960s and almost all of them have been snapped up by existing businesses. There are also phone companies out there that hold highly valuable custom 800 numbers hostage in order to “rent” them or “lease” the numbers to local businesses for a hefty monthly fee. 4. Is getting a custom 855 or 844 or 833 number as good as getting a custom 800 number? The 855, 844 and 833 toll free numbers work the same as 800 phone numbers do. The only difference is 855, 844, and 833 numbers are newer and therefore there is options and opportunity to find the perfect custom toll free number. Even Fortune 500 companies and popular television shows like “Dancing with the Stars” use these toll free number prefixes as marketing tools. 5. How do I get a number that has been disconnected? Ever come up with the perfect custom toll free number and just decide to call it? And when you do you hear a disconnected message or tone or whatever? And you think – “Great, the number is not in use so it must be available”? Unfortunately, you would be wrong and the odds of you getting it are virtually zero. Here’s the deal. Just because the number is disconnected does not mean it is not technically “in use”. Because 800 numbers have been around for such a long time, tens of thousands of companies have snapped them up and used them for different purposes. Overtime, the numbers might get forwarded to a ring-to number that has been disconnected. So technically, the toll free number itself is active but the ring-to number (the local number the toll free number is forwarding to) is disconnected. And here’s the kicker – there is no way of finding out what company owns the toll free number because that is private information. The only thing you may be able to dig up is the phone company that supplies the toll free service to that number, but that phone company cannot provide you with their customer’s information because that is private. So don’t waste your time. 6. Can phone companies rent vanity numbers? At UniTel Voice, we don’t rent numbers. If you purchase a custom vanity number you own that number and can keep it with UniTel Voice or port it to the phone company of your choice. Your number is your business asset. But to answer the above question: Yes, some phone companies rent great numbers like 1-800-DENTIST to local dental offices. The neat part is, these companies can use geographic call routing so, they can lease the number to a Chicago dental office and a New York dental office. When people in Chicago call the number they get the Chicago location. When people in New York call the number they get the NY location. The downside is you don’t own the number, you are renting it and it can cost a ton. If you stop paying, you lose the number and your competitor down the street can start using it. All the advertising you did to promote the number is wasted and now benefiting your competition. 7. Should my company use a custom toll free or local number? Custom local numbers are hard to find because local DID numbers are not stored in a centralized national database like toll free numbers are. However, the real question you want to ask yourself is, do I want a national presence or a local presence. Also, toll free numbers often feel more professional to customers than local numbers do. 8. If I purchase a custom toll free number from UniTel Voice – do I own it? Yes, with no strings attached. You can use it with UniTel Voice’s low cost toll free service or port it to another service provider of your choice. There are no long term contracts locking you in. 9. How many custom vanity numbers should my business use? We recommend using the best custom number you can find as your primary business number but it’s smart to A/B test three or four other custom numbers. You can use one number for your online ads, another for print, and another for radio and track ROI and conversation rates. UniTel Voice allows you to add as many number to your account as you’d like and track the calls for marketing purposes. 10. When is the best time to get a great custom toll free number? You can sign up for a vanity number at any time but the best time is right before the FCC releases a new toll free prefix. When this happens you get the unique opportunity to pre-order a custom toll free number before it’s released to the general public spear pool. Here’s an article that explains how this recently went down with the release of 833 numbers.